The NHLPA Goals & Dreams (G&D) fund was in Winnipeg, Manitoba last Monday to celebrate the donation of 25 complete sets of new hockey equipment to KidSport Winnipeg. The donation was announced at MTS Iceplex with 30 kids in attendance – many of whom KidSport has directly supported – from Sagkeeng First Nation and Swan Lake First Nation. While the donated hockey equipment will go a long ways towards KidSport Winnipeg helping more local children in Manitoba play hockey, the highlight of the day for the young hockey players was a surprise meeting with Jets players Mark Scheifele, Chris Thorburn and Adam Lowry. 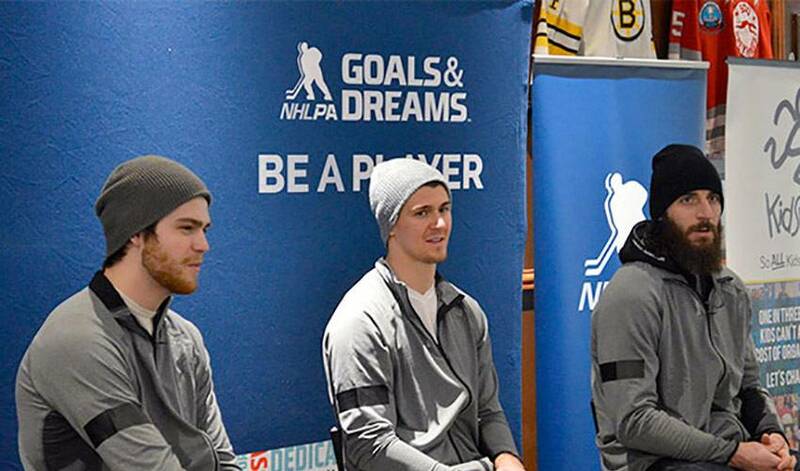 The three NHLPA members greeted the kids in their dressing room after hockey practice, and later signed autographs, answered questions and helped the young players with their hockey skills. Last week’s equipment donated by G&D is valued at approximately $12,500 and through KidSport Winnipeg, it will give more youth the opportunity to play hockey. G&D and KidSport have a longstanding relationship that has grown over a number of years and many equipment donations. KidSport is a national charity administered in Manitoba by Sport Manitoba which provides support to children in order to remove financial barriers that prevent them from playing organized sport. KidSport believes that no kid should be left on the sidelines and all should be given the opportunity to experience the positive benefits of organized sports. Launched in 1999 as a way for the players to give back to the game they love, G&D has donated over $23-million to grassroots hockey programs. Over the past 16 years, more than 70,000 deserving children have benefited from receiving G&D donations of full sets of hockey equipment. The players’ program has also assisted with upgrades and the building of hundreds of arenas worldwide in addition to the hockey equipment donations. G&D donations have spanned a total of 34 countries to date: Algeria, Australia, Austria, Bosnia, Bulgaria, Cambodia, Canada, Costa Rica, Czech Republic, Ecuador, England, Finland, France, Germany, Greece, Hungary, Iceland, India, Ireland, Israel, Latvia, Lithuania, Malaysia, Mongolia, Netherlands, Romania, Russia, Scotland, Serbia, Slovakia, South Africa, Sweden, Ukraine and the United States of America.